Today is Earth Day, a day when almost 200 countries worldwide demonstrate their support for environmental protection. With Earth Day coming a week the U.S. tax deadline, I have been researching ways to save money on yarn, including methods of recycling yarn. I asked members of the Crochet Me Facebook page for their suggestions for saving money and recycling yarn. Here are some of their best suggestions. Check out Sarah's blog and find great ideas for organizing your stash. 1. Don't toss the leftover few yards of yarn when you finish a project. These bits work great for embellishments and striped projects. Kas saves all of the left over ends of her skeins, then joins them using a Russian join to create her own variegated yarn. 2. If you are looking for yarn on a budget, several crocheters suggested checking out your local thrift shop. Keep your eye out for miscellaneous bags of yarn. You can't beat the price. This yarn might not still have its original ball bands, so research ways to determine a yarn's fiber content. Sue also finds yarn at estate sales and auctions. 3. Carol suggests using PDF crochet patterns to save on paper and printing. You can read PDF patterns on many phones, laptops, and tablets and many magazines, including Interweave Crochet, are available as digital downloads. 4. Leona makes her own "yarn" by cutting old tee shirts into strips. She uses this yarn to create crocheted rugs. 5. Check out crochet and knit pattern books from your local library. 6. Another great suggestion from several Crochet Me members was to use raveled yarn. Buy finished sweaters from the local thrift store, then ravel them and use the yarn for your own project. You can also ravel works in progress that you are no longer excited about. 7. I love Dawn's comment. She said,"Crochet and knit in public tends to lead to people just giving me yarn." I may have to try this approach, but you will also find that family members or friends may have stashes of yarn that they will not use and would be happy to donate to your next project. 8. 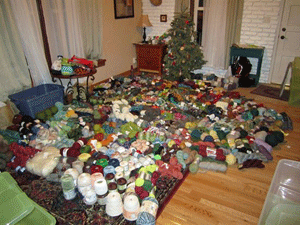 A great idea from is to set up a yarn swap with some of your fellow crocheters and knitters. It's a great way to clean out your stash at the same time as finding the perfect yarn for your next project. P.S. What ideas would you add to this list?